Looking at these beautiful pictures of Pulut Inti, a decadent Nyonya kuih, it suddenly dawned to me that I haven’t had pulut inti for the longest time. Pulut inti was my late grandmother’s favorite Nyonya kuih. When I was growing up, there was this Benggali/Punjabi kuih hawker (he would carry his kuih container on top of his turban) who came by our house every morning. Grandma always bought his pulut inti, wrapped nicely in a banana leaf parcel, with the filling (inti) exposed and unwrapped. In the front yard of our house, grandma also grew a “bunga telang” plant—the key ingredient used to color the glutinous rice (sticky rice) to a natural blue. The bunga telang were plucked off the vine of the plant and let dry under the scorching hot sun in Penang for a few days. Then, my family rejoiced as it meant grandma would make pulut inti or pulut tai tai, another legendary Nyonya kuih served with kaya, or coconut and egg jam. Please welcome Siew Loon as the contributor again as she shares her pulut inti recipe, a special Nyonya kuih that probably brings lots of bygone memories to many of us. Pulut Inti has always been my daughter’s favorite and I took the opportunity of the long weekend (Hari Raya holidays in Malaysia) to make some. Pulut Inti is a popular sweet Nyonya Kuih. 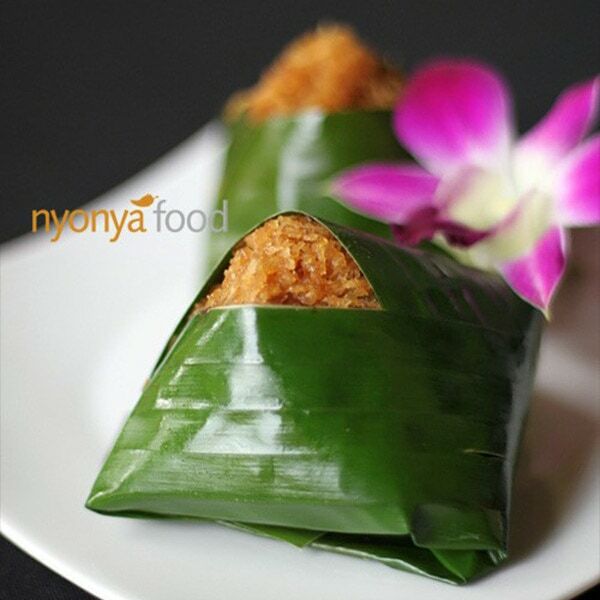 It is made of steamed glutinous rice with coconut milk and eaten with coconut filling. “Pulut” means glutinous rice and “Inti” means filling in Malay. Blue pea flower or “Bunga Telang“ in Malay is being used to color the rice. It gives the rice a very sweet natural “blue” color. Soak blue pea flower in hot water for 15 minutes till water turn blue. Sieve the water out. Soak the glutinous rice in blue pea flower overnight or about 6 hours. Steam glutinous rice in steamer for about 25 minutes or till rice is soft. Mix coconut milk and salt. Add into steamed glutinous rice and continue to steam for another 10 minutes. Break the brown sugar/palm sugar into small pieces. Combine with the sugar, pandan leave and water. Cover over a medium flame until sugar dissolves. Add in grated coconut and stir till fragrant. Add conflour mixture and stir for 2 minutes. Leave to cool. Hey There, Was Wondering, 1 Grated Coconut Equals To How Many Grams Roughly Please? Thank you for all the yummy kueh recipes. I wonder where you can buy the blue pea flowers?